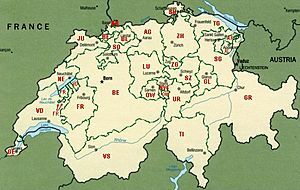 The 26 'cantons' of Switzerland are the states of the country of Switzerland. In Switzerland, the individual municipalities and cantons are very free. Usually, there is a Swiss law (at the level of the whole confederation). Very often this states general things and says that the cantons must follow this rule. The cantons then make detailed rules, each in the way it sees fit. Sometimes this leads to strange situations. There are 26 different schooling systems. Drug abuse is an offense, at the federal level. Punishment is usually 1 to 3 years, but can also be only a fine. The problem is: Consumption itself (not trading, or giving away for free) is not punishable. Also in light cases, the police can say that there will be no fine. This has led to the fact, that in each canton, this law is applied differently. In one canton, smoking a joint will mean a fine, in another, it can mean a prison term. Cantons of Switzerland Facts for Kids. Kiddle Encyclopedia.